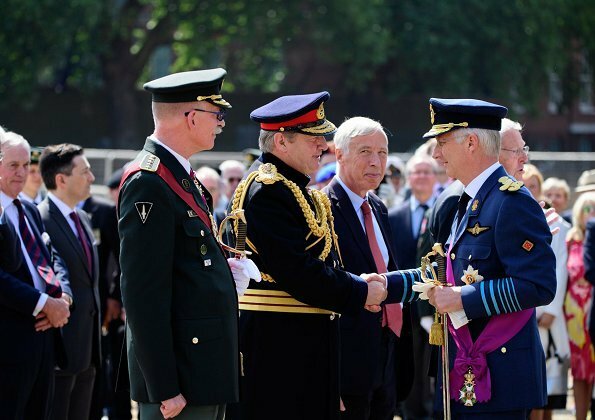 On 14th July, the annual Belgian Parade at the Cenotaph in Whitehall took place. 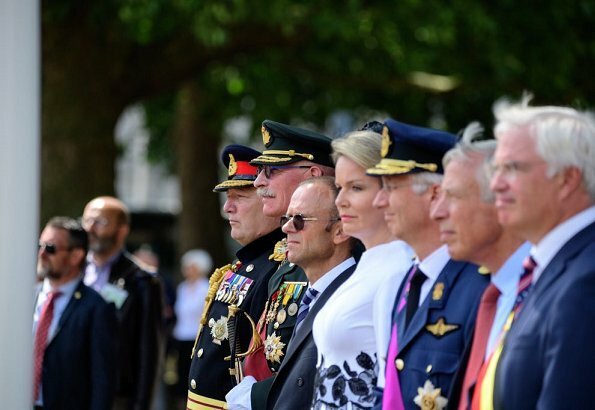 King Philippe and Queen Mathilde attended the annual Belgian Remembrance Parade at Horse Guards Parade in London. On this occasion, The King and the Queen laid a wreath at the monument. Afterwards, The King and the Queen met with Queen Elizabeth II at Windsor Castle in London. 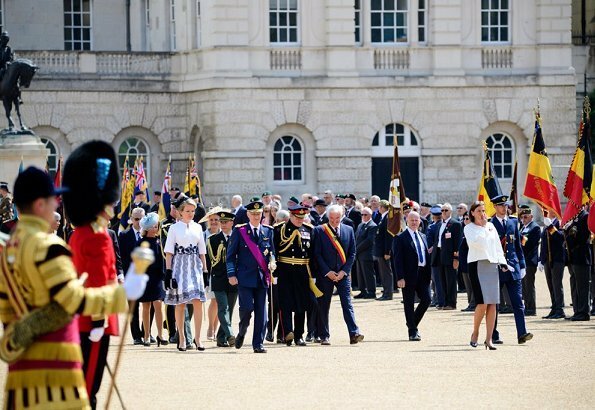 The Belgian Parade in London has takes place annually since 1934 on the Saturday preceding Belgian National Day. Both of Mathildes outfits are lovely and she wears them well. Queen Elizabeth looks fresh and cool in those colours. Three dignified royals. Wow, absolutely loving what Mathilda is wearing. Wow Mathilde! Love both dresses! De geboren jonkvrouwe d'Udekem d'Acoz, Hare Majesteit Koningin Mathilde van België, geloof me, zeldzame klasse! Oh, what an event only shortly after the Belgian team beat the english one for the third place in the worldwide football championship! Mathilde looks wonderful. And so does Queen Elizabeth! BTW Philippe is handsome also! 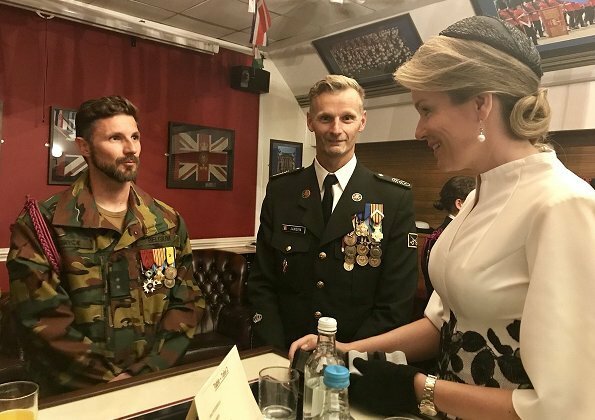 With no doubt Queen Mathilde exudes elegance and warmth. Mathilde looks like a real queen, I love both outfits! 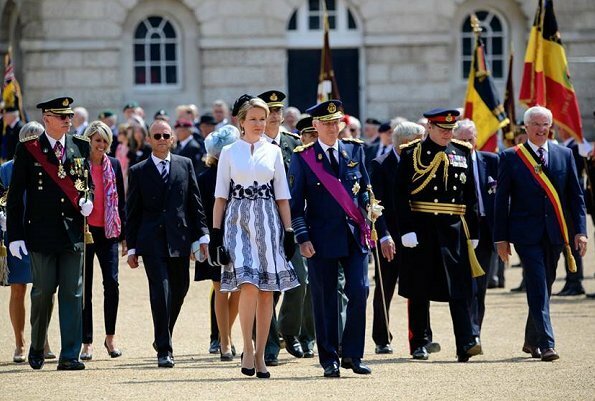 Beautiful dress on queen Mathilde, birh ladies look wonderful. Queen Mathilde chose Natan to meet her Majesty and she wears it very well. Classic colours blue and white look fresh and open for a good together, think so. Both dresses very pretty. She looks great! 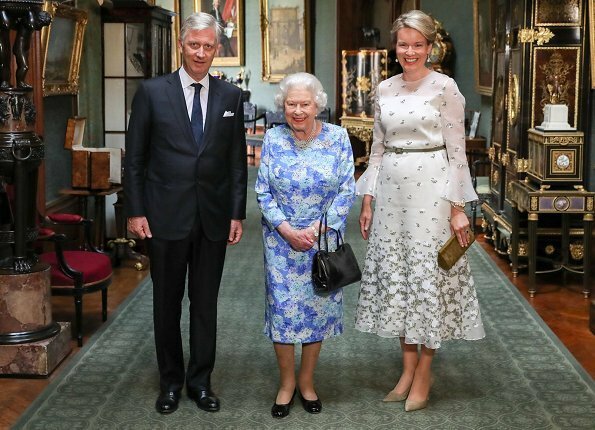 I'll bet anything the Queen was much more pleased hosting Philippe and Mathilde than 'you know who' the day before. Class vs thrash. How do you know Mrs Melania Trump? couldn't agree more (it's not hard to imagine how differently the two respective conversations went and which one her majesty enjoyed. What shamefully nasty, snide comments. Btw, this is a fashion blog. It's great to see Belgium's Royals with our Queen at Windsor Castle! Great to see Belgium's Royals with our Queen at Windsor Castle! Thank you Jane Chantal. (I am a new Anon to this thread.) There are so many nasty comments day after day. Let's compliment the Queen for her extraordinary diplomacy in every situation. And she does it in style. 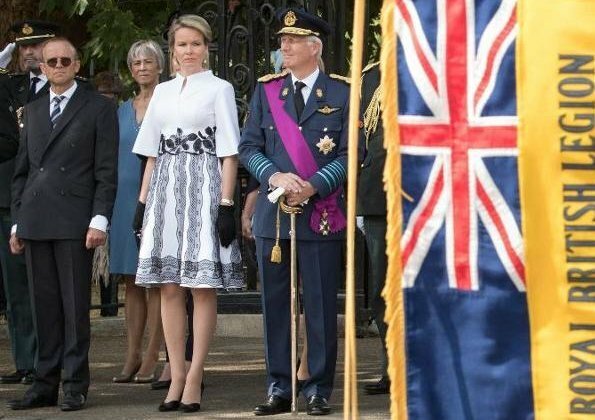 Both of Mathilde's outfits are lovely but I do especially love the dress she wore at Windsor. Queen Elizabeth is wearing a pretty dress and looks very happy to receive her guests. Q Mathilde looked great in both dresses never seen the one she wore for the parade,very lovely.The dress she wore meeting Q EII I believe was from Natan.Very nice work.Big smiless on their faces. Gabriella, did her Majesty tell you that in person??? are perfect for formal occasions or slightly less formal occasions. The Queen looks lovely as always. Beautiful Mathilde! This time her dresses fit perfectly and are the perfect length. Maybe she switched designers. If so, she should drop Natan and never look back. 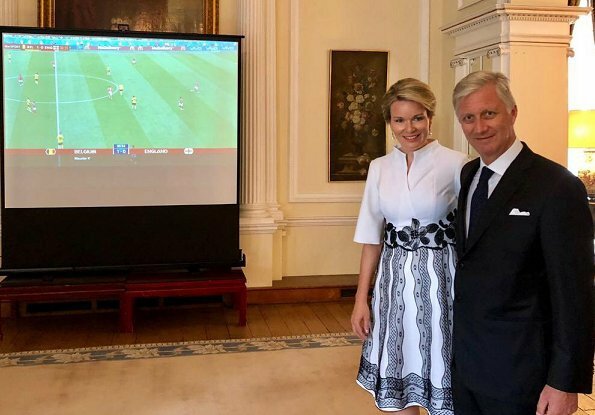 Queen Mathilde wores Natan this time. 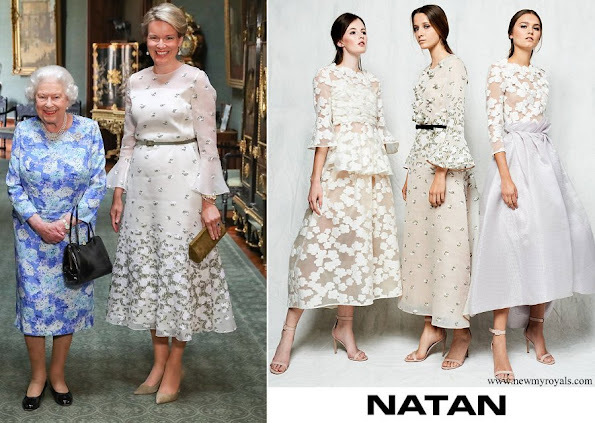 Love the second frock Mathilde is wearing, so pretty! It was during the match against England. The king and queen were having tea with queen Elizabeth at Windsor castle when someone came and told them the Belgians won. 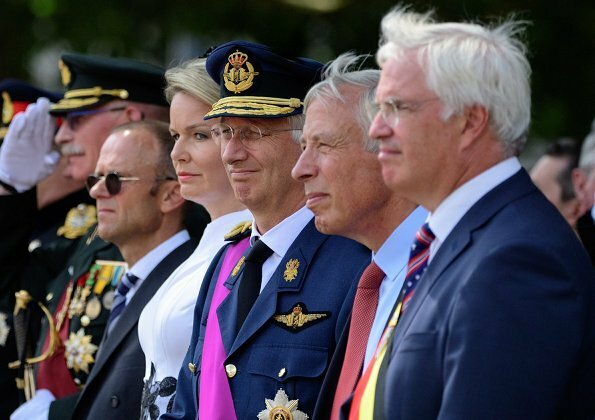 The king told so himself when the Red Devils were received at Laeken castle.